I cried actual tears of joy and clenched my fists in righteous fury while watching Marco Rubio get owned so hard in the CNN-broadcasted town hall debate tonight that he actually looked at times as if he were struggling to keep his NRA-backed eyeballs from popping out of his head from the mind-boggling shame of it all. On Wednesday evening, Republican Florida Senator Rubio participated in this gun control town hall where he was grilled by survivors of the Marjory Stoneman Douglas High School shooting and bereaved parents about his refusal to disavow the NRA or support an assault weapons ban, and was repeatedly booed (but also cheered at moments that similarly devastated his rhetorical powers, such as they exist). 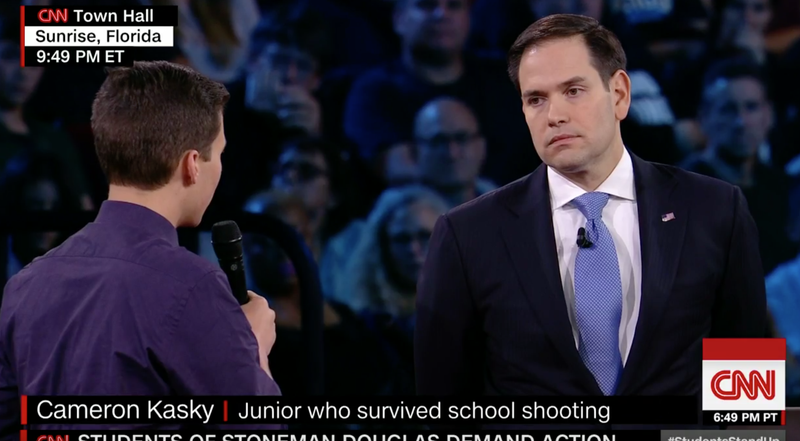 “That’s a valid position.” “That’s important to know.” These are just some of the callow, empty responses Rubio is able to muster as he clings to his weird, manipulative justifications for taking no action on gun control. I think it’s best to just watch the choicest, most cathartic clips, if you haven’t already.